Customers are all about the now: if the need arises, they can walk into a bank and get a credit or debit card not only issued or replaced immediately, but personalized the way they want it. The Panini Cardmint FX was specifically developed for instant financial flat card issuance, allowing you to meet and exceed your customers’ expectations, and it works as an ideal complement for Panini's Cards On the SpotTM FII (Financial Instant Issuance) software platform. 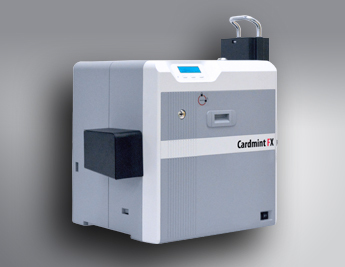 This easy-to-use dual-sided printer delivers Banks and Credit Unions the capability of printing any image on EMV-compliant magnetic stripe, contact chip, and contactless (RFID) cards. Retransfer technology produces brilliant colors printed over-the-edge, leaving no unprinted white border. Impressive quality at a totally reasonable cost! 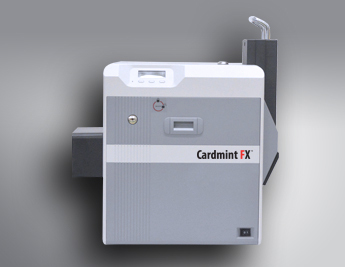 With its compact size, the Cardmint FX fits neatly into any branch environment, and can be used behind the counter without creating distractions – it operates quieter than any printer in its class, and it is ruggedly designed and constructed for top-class reliability and continuous operation, as well as compliant with physical and logical security regulations for financial issuance applications.